This guide presents resources useful in the study of classical art and archaeology and pertinent to the Fordham Museum collection. New York: Fordham University Press, 2012. 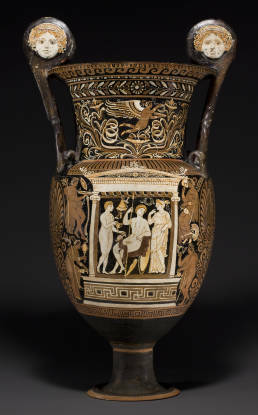 The antiquities in the Fordham Museum of Greek, Etruscan, and Roman Art were donated to the university by William D. Walsh, an alumnus of FCRH, and his wife Jane. The museum occupies 4,000 square feet of space on the main floor of the Walsh Family Library. The collection comprises more than 260 objects dating from the 4th millennium B.C. through the 3rd century A.D. and offers visitors to the museum a compendium view of the material culture of the ancient Mediterranean world. The museum's most important function is its role as an essential campus resource and teaching collection, the value of which lies not only in its impressive chronological and regional scope, but also in the range of subject matter, types of objects, mediums, and artistic styles represented. On display, for instance, are extremely fine examples of Roman imperial portraiture and painted Greek pottery, as well as mass produced yet highly expressive terracotta votive sculpture and simple, utilitarian table ware. These objects reflect both the elite and humble circumstances of life in antiquity, and as such present a truly well-rounded cultural view of the Classical world. The museum, which is free of charge, is open to the general public Monday through Saturday 9:00 am – 5:00pm. Visitors are required to present a valid photo I.D. to security for access to the campus and the Walsh Library. Sunday 12 Noon - 12 Midnight.